My latest for the magazine is online now, and it’s a pre-election piece called “Five Memes That Deserve to Die.” That’s the subhead, anyway. 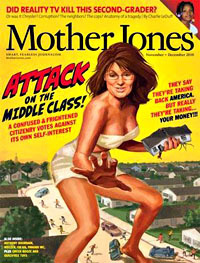 The real headline is “Invasion of the Brain-Devouring Platitudes,” which goes better with the conceit of our horror movie cover featuring Sarah Palin as a 50-foot woman. (Explained here.) Basically, it’s a collection of five memes about the election that I’m pretty sure are wrongheaded regardless of how things turn out next Tuesday. Which is convenient, since I don’t know how things are going to turn out next Tuesday. As it happens, I wasn’t very happy with how the piece turned out. But I’ve always wondered what the journalistic etiquette is for that kind of thing. Go ahead and admit it? Or just promo it as usual? I’m not sure. Besides, I read through it again this morning and it didn’t seem all that bad after all. So maybe I was just in a cranky mood the week I wrote it. I’m sure you’ll all let me know in comments.